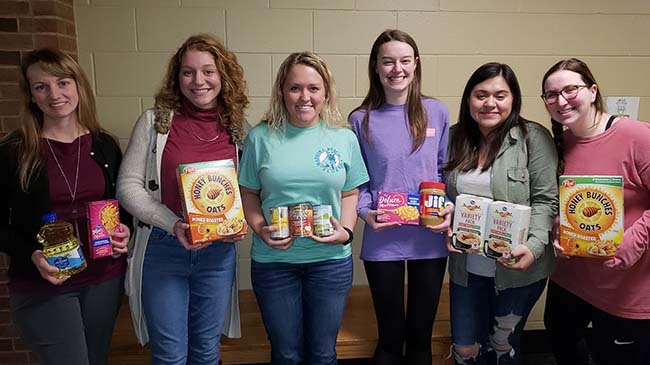 Karen Richie (l), counselor/care manager in the Office of Personal Counseling, accepts donations from members of the IU Southeast SHRM student chapter: (l-r) Hannah Shaffer, Alexis Schindler, Katie Mueller, Karen Martinez, Carley Calabro. Photo by Dr. Alysa Lambert. (NEW ALBANY, Ind. )–The IU Southeast student chapter of the Society for Human Resource Management SHRM) raised $111.00 and collected donations during their November and December breakfast series to support the campus emergency food pantry. The pantry was started in 2015 to serve students in need of a helping hand. It is estimated that up to 25% of all college students nationwide are food insecure. SHRM students presented the gift to Karen Richie, counselor/care manager in the Office of Personal Counseling, where the pantry is located. The HR Breakfast Series brings 25-40 HR professionals to campus on the second Friday of every month from September to April to deliver presentations on hot topics in HR and network with students in the field. During this fall’s HR Breakfast Series events, local HR professionals and students brought donations. Professionals who donated were entered in a drawing to win a certificate to attend a breakfast series event for free. The student chapter also donated some of the proceeds from the breakfast series events to the SHRM Foundation, which supports varied HR-related philanthropies, such as student scholarships. Philanthropy is a core value of the national SHRM organization, according to Dr. Alysa Lambert, associate professor in human resources management and faculty advisor to the student chapter. It is also an integral activity of the IU Southeast student chapter, which has completed a service project every year for the past five years. Among other efforts, the students have provided pro bono counsulting to local organizations and supported children battling cancer. For Lambert, these efforts help students understand that there is more to business than personal enrichment. For chapter members, the donations are a way to express solidarity with fellow students who may be in need. Homepage photo: Karen Richie (l) receives a box of donations from SHRM student chapter president Alexis Schindler.